We are a team who were born and raised from 2 different sides of the world.. from 2 continents - Asia and Europe. We are a food enthusiasts/foodies, collectors, travelers, culinary researcher; lexicographers and computer/IT specialist, respectively. We are team of a Sociologist, who love to learn the culture of other countries through their cuisine and the meaning of food in their everyday lives and an expert in Computer/Information Technology specialist, which has triggered the project. The Food Glossary started from long years of collecting recipes, cookbooks, and everything about food and related subjects since I was a teenager, the love for eating, travelling and learning other cultures. I have always been intested about other people and culture and one way to get to know about other culture is to study about their cuisine, how they cook, how they eat and what kind of dish and meals they prepare. Thru this Glossary, I have realized that we really have a small world, our lives are intertwined, we are one, we are only separated by vast oceans. The food of another country can also be found in other countries in just different form, cooked in different way but still the same. Thru my research, I see that geography plays an important role in the cuisine and the kind of food and drink available each country . Likewise, religion (traditions and beliefs) plays a great role in cooking and cuisine. 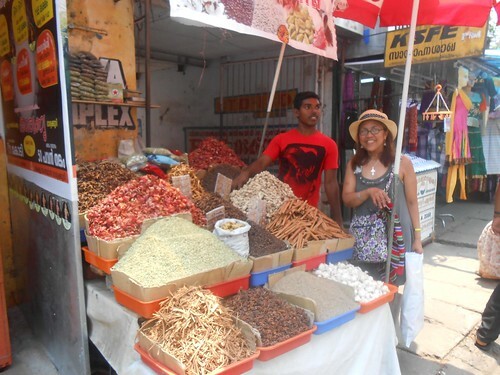 My picture above was taken in the side streets of Allepey, Kerala, India where varieties of spices are being sold. 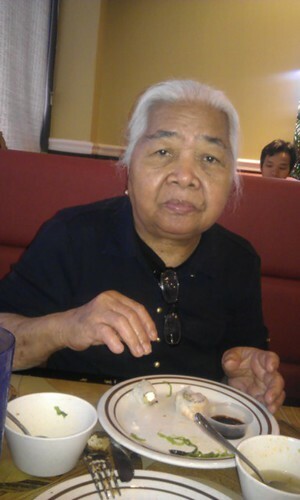 Below, the greatest cook of all time, the best Chef I have ever known, my mommy, to whom I dedicate this glossary. Below, enjoying Chinese, Thai and Japanese foods. She is not only a very good cook, she is also a foodie like everyone of us in the family.